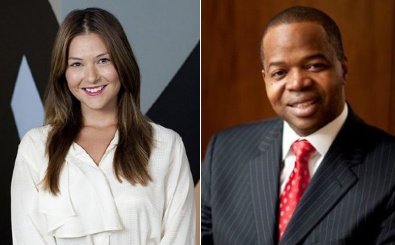 After getting pressure from the victim’s family, DA Ken Thompson, right, filed felony charges against the driver who veered onto a Fort Greene sidewalk and killed Victoria Nicodemus, left, in December. A grand jury has indicted Marlon Sewell for second-degree manslaughter six months after he jumped a curb in Fort Greene and killed 30-year-old Victoria Nicodemus while driving with a suspended license, Gothamist reports. Brooklyn DA Ken Thompson had refrained from pressing felony charges until Nicodemus’s family pressured his office to take action. On December 6, Sewell, driving a Chevy SUV on eastbound Fulton Street, veered onto a crowded sidewalk instead of slowing down for a bus pulling into a stop near S. Portland Avenue, according to witnesses. He struck Nicodemus, her boyfriend, and another person. At first Thompson charged Sewell only with aggravated unlicensed operation of a motor vehicle, an unclassified misdemeanor, and operating a motor vehicle uninsured, a traffic infraction. The maximum penalty for the misdemeanor is 30 days in jail and a $500 fine. Last month it appeared that Thompson’s office would not be pursuing any further charges against Sewell. While Thompson is considered a leader on street safety, he nevertheless has a history of declining to file charges against drivers who kill people. Nicodemus’s brother Hank Miller told Streetsblog earlier this month that he was advocating for Thompson “to go out on a limb a little bit” by pursuing the charges when they might not win a conviction. “It seems to my family that they’re really beginning to be OK with just standing pat on the misdemeanor charges, and for us that’s unacceptable,” he said. The family launched an online petition calling on the DA to “at minimum” bring the case before a grand jury for a full investigation of the crash. Miller told Gothamist that he believed the petition’s 1,800 signatures sent Thompson a clear message that led to this week’s indictment. So if I am killed and do not have family members to advocate for justice, there will be no justice? I want New York to have criminal justice enforced by laws, not political pressure. Anyone else find it disturbing that charging someone with more than a traffic infraction for driving a vehicle, while unlicensed, at such a rate of speed as to be unable (or unwilling) to stop for a bus, on city streets, and choosing to drive onto the sidewalk as a result, is “going out on a limb”? I feel like most cities in the world, you’d be walking off the end of a limb to suggest not doing so. It’s completely insane. But, yes, we are the weirdos. Apparently almost all of NYC’s power structure still feels like this is a big, bold, risky sort of move for a D.A. to make — actually prosecuting a reckless driver who took an innocent woman’s life on a sidewalk in the middle of a neighborhood.